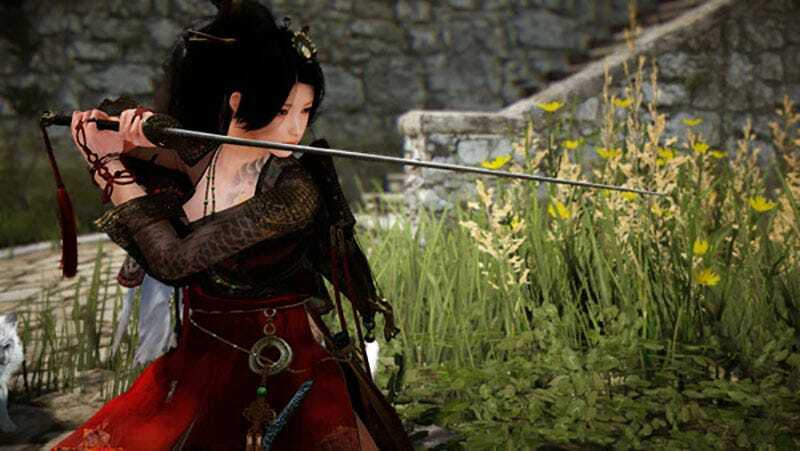 And now the moment I’ve all been waiting for, Korean blade warriors Musa and Maehwa arrive in the massively multiplayer online role-playing game Black Desert Online later this month, demonstrating two slightly different ways to mix short bows and swords. The Musa and Maehwa are essentially male and female versions of the same class, similar to the Wizard and Witch. Both classes utilize a sword and shortbow to weave in and out of battle, incapacitating from afar and then moving in for the kill. The difference is the Musa is more area-of-effect focused, perfect for taking on small groups of enemies, while the Maewa excels at locking down a single opponent and keeping it occupied. I’ve been looking forward to the Musa. He sounds like my kind of character. I enjoy cutting swaths. The Maewa is a bit more of a brute. Just a little. Of course a pair of new classes also means a fresh couple of starting points for that character creator everybody loves so much. On one hand I hate the fact that we have to wait for classes already released elsewhere to arrive in North America and Europe. On the other, I like swords. Hooray for swords.